This picture was taken on a ten-day Tropical Audubon Society trip to Trinidad and Tobago in June, 2012, ably led by their fieldtrip coordinator, Brian Rapoza. 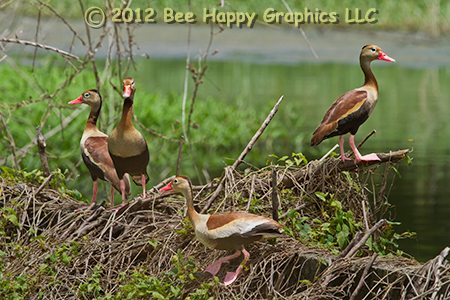 Black-bellied whistling ducks are mostly not migratory and unlike most ducks, form strong monogamous pair-bonds. Males and females look alike. The breast and upper back of the southern subspecies are gray, compared to the darker brown on the northern subspecies seen in the United States. Photographic details: Canon EOS 7D camera w/ EF 100-400mm f/4.5-5.6L IS USM lens set at 330mm. Flash was used. Camera was on f/9.5 for 1/500 second at ISO 200. Fine Art Paper N/A 15" x 22"
Canvas N/A 20" x 30"